Enjoy this Sonoran desert trail through the McDowell Mountains Preserve wilderness, leading up to the towered Thompson Peak. 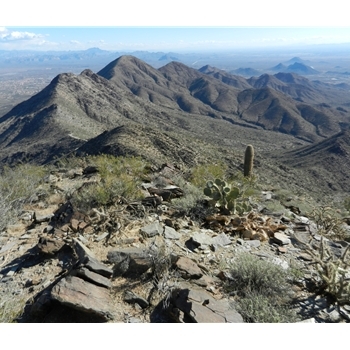 Features and Interests: Majestic views of entire Phoenix areas; old mine access. Trail Description This beautiful trail starts in a gated neighborhood where you will walk the footpath for the first 1/2 mile to the official trailhead, marked as Dixie Mine Trail. The first 2 miles of the trail is relatively flat with rolling hills and washes. A good family, shorter hike, you will be able to enjoy the full views of Superstition Mountains and Four Peaks. After 2 miles, you will reach the Dixie Mine turnoff (mine visible straight ahead) where you will take the Jeep/maintenance road left marked to Thompson Peak. From this point, the trail gets steeper and steeper. We nicknamed this part the Widow Maker as even the seasoned/fit hikers will need rests along the way. Being so steep, the trail/road needed a concrete paving to access the top of the peak. The climb provides a serene feeling of ridge-line hiking, offering amazing views along the way as you quickly climb 2000 feet to the peak. The finish line is the majestic peak which offers the best views of the valley and dwarfs any other mountain or hike (like Camelback)...if only the towers weren't present! Returning the same way, you can explore the Dixie Mine on the way down with a small detour!